Last year in this blog, I wrote about about TextProject (http://textproject.org) , a not-for-profit organization that supports struggling readers with appropriate texts see the earlier blog on TextProject at https://literacybeat.wordpress.com/2011/10/14/exploring-the-textproject-website-and-text-complexity/. The site changes constantly, as new materials are added. Below is a screenshot of the current homepage. 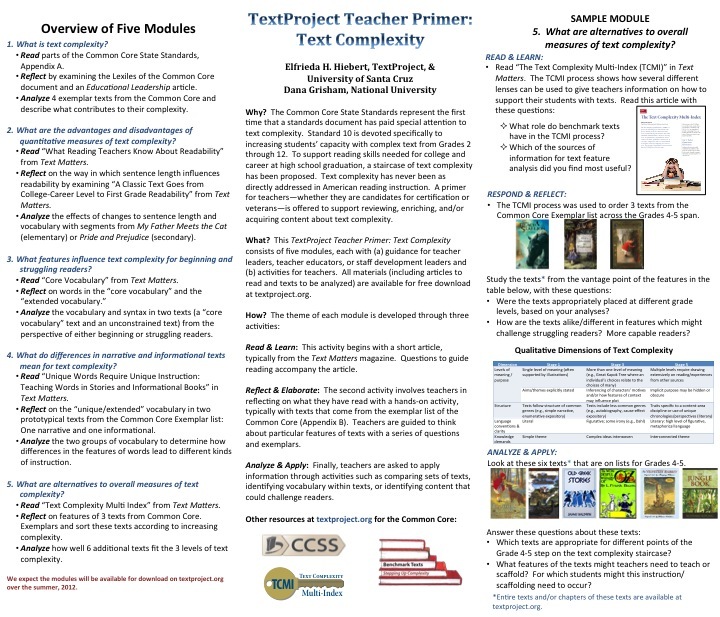 The project is headed by Elfrieda Hiebert (Freddy to all) and recently, I have been working with Freddy to provide modules on text complexity to teachers and teacher educators for professional development. The good news is that the modules (5 of them) will be posted to the TextProject website this summer; the better news is that everything will be FREE to interested parties. You will be able to download the modules and all materials that go with them at no cost. We recently made a research poster presentation on the modules at IRA. The poster shows you the content and instructional sequence of the modules and provides an overview of the final (5th module). Our poster is displayed below. Speaking for myself, after three decades of teaching reading, I thought I understood text complexity. I found out that I had a somewhat superficial understanding when I began working with Freddy. So this blog post concerns several important understandings that relate to text complexity and the Common Core State Standards (CCSS). One of the instructional tools that we decided NOT to use is a WebQuest, but for teachers and teacher educators, I think the WebQuest works well to acquaint educators with the CCSS and with some elements of text complexity. I decided to share the WebQuest with you here and you are invited to use it in whatever way you think appropriate. I have field-tested it with several groups of teacher candidates and most of them expressed appreciation for the “just in time” learning. Critical evaluation of information is an important skill in a print-based or electronic environment. A WebQuest is an inquiry-oriented lesson format in which most or all the information that learners work with comes from the web (Internet). 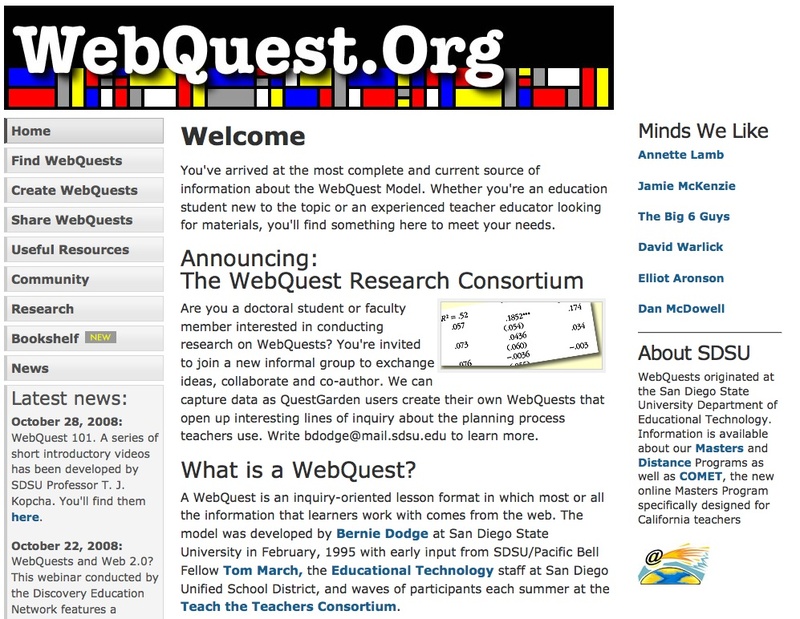 The WebQuest model was developed by Dr. Bernie Dodge at San Diego State University in February, 1995. (You can find out more about WebQuests by visiting the official website at http://webquest.org/index.php). http://webquest.org/index.phpThere are now a number of websites where WebQuests on various subjects may be downloaded and used. For the Webquest on CCSS, if you are a teacher educator, I recommend dividing it into three parts for use during class sessions or completing it over several sessions of the class. If teacher educators have access to computer labs on campus, the students may work there during class (supervised by the instructor) and may work in pairs or small groups to complete the assignment. It may also be used in this way for professional development for practicing teachers. Teachers who may be interested may adapt, skip parts that are not of interest to them, or focus on single questions they might want answered. In order to understand the CCSS, you might also want to spend some time acquainting yourself and/or teacher candidates with the CCSS. 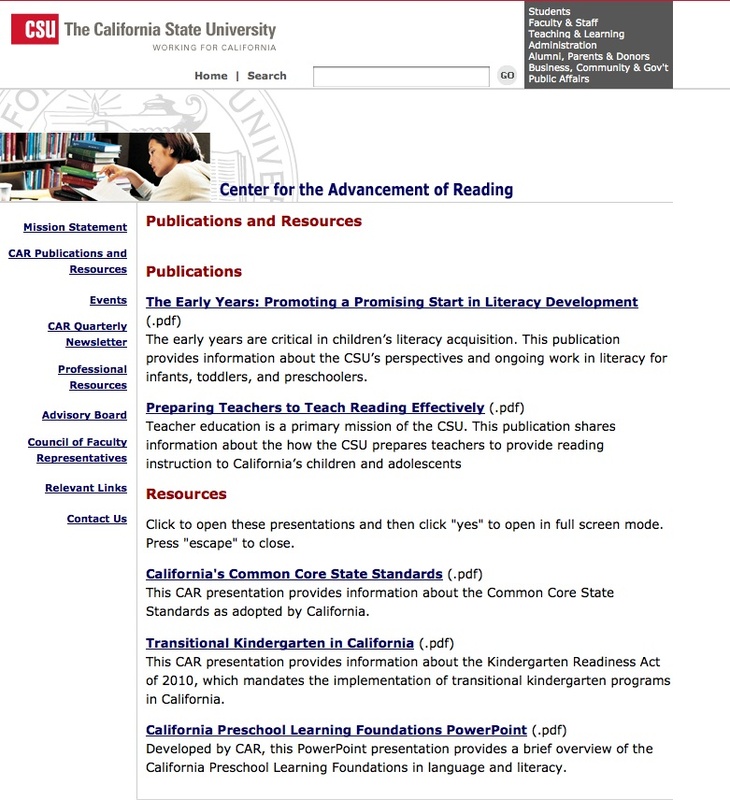 One resource is a PowerPoint (in pdf format) presentation that is available through California State University’s Center for the Advancement of Reading (CAR) and available as a free downloadable pdf at http://www.calstate.edu/car/publications/. There are many helpful publications on the website in addition to the CCSS PowerPoint. In closing, we know that CCSS will generate new assessments for our students, that state standards and curriculum frameworks will change, and that our students will be expected to read more non-fiction more closely and learn to read and write in emphasized genres. How can we use our professional judgment and available technological tools to aid this process? And how can we incorporate these standards into our teaching in a caring and thoughtful way? To complete this task, you must carefully read and respond to the questions. Please remember that this task is designed to assist you to become familiar with the Common Core State Standards and your specific content area standards to assist you in your professional life. How are the CCSS to be implemented? What is text complexity and why is it important? What is the difference between narrative and expository text? How does this affect our teaching of reading? The following websites will be used in this WebQuest. What is the stated mission (purpose) for the Common Core State Standards? What motivated the NGA and CSSO to generate these standards? How many states have adopted the CCSS? Has your state adopted the CCSS? If so, what is the URL (web address) for the CCSS in your state? What is the recommended percentage of literary and informational text at 4th, 8th, and 12th grade levels and what do you think this means for you as a teacher of reading? How are the English/Language Arts standards for K-5 and for Grades 6-12 organized differently? Why do you think this is? How do the CCSS standards define text complexity? Look at page 31, Standard 10. What are the three factors for “measuring” text complexity? Go to Reading Standards for Informational text, page 39/40. Choose one grade and read the components; compare to the next or previous grade level components. What are the differences in text complexity in the two grades? Choose a grade level for literacy in History/Social Science (p. 61) paying attention to how Language Arts is integrated in Social Science. What does this mean to you as a teacher? Why would this be important to a K-5 teacher? For the E/LA standards, there are three Appendices (these are NOT in the document you downloaded). Go back to the website and locate these appendices. Download Appendix A. What is the subject of this appendix? What was the message of the ACT, 2010 report called Reading Between the Lines? What is meant by “complex text” and what definition is given of this term in the literature review? What does Appendix A have to say about scaffolding reading instruction? What is the three-part model for text complexity (p.4)? Which one is measurable by computer? What measure is used? Read the Key Considerations in Implementing Text Complexity (p. 8). 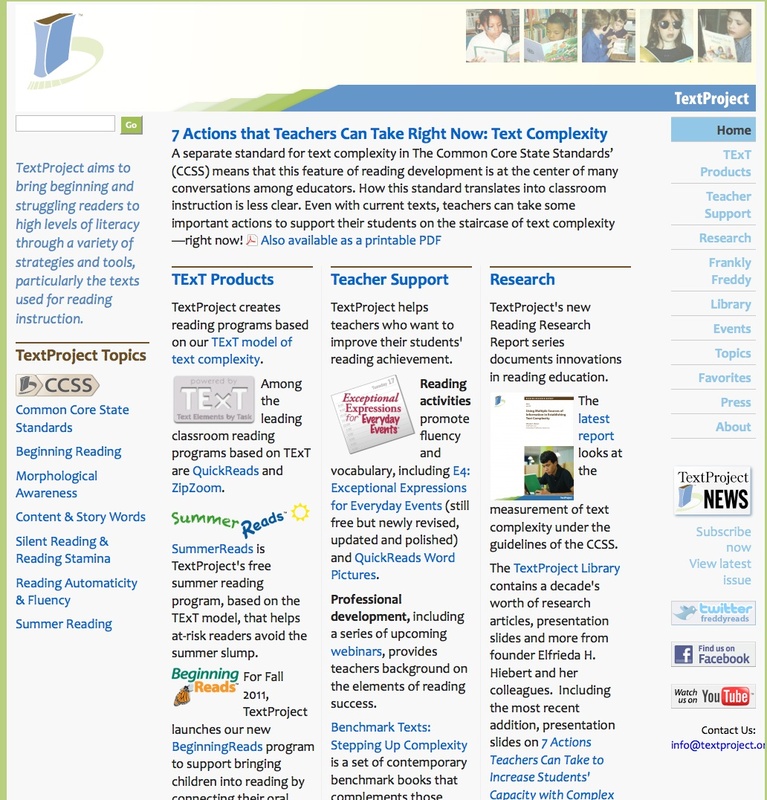 What do we know about the tools for measuring text complexity? Looking at Figure 3, (p. 8), what can we say about Lexile Range changes? Why do the authors recommend that teachers decrease scaffolding and increase independence? Download Appendix B and read about the process of text selection for exemplars. Talk about your own definition of complexity, quality, and range. Why are these exemplars important? The authors of the CCSS make some caveats about the exemplars. What are they? Read the FAQs about the CCSS (on the website). What questions still remain for you? View the video at http://www.lexile.com/about-lexile/lexile-video/. Should teachers allow students to read above or below their Lexile level? Why or why not? Books that have prefixes (IG, NC, etc.) before the Lexile level (called Lexile Codes) have meanings for teachers, librarians, and children. Focus on one of these Lexile Codes and tell why this is important. What is the relationship of MetaMetrics and the CCSS? What questions still remain for you?In closing, we know that CCSS will generate new assessments for our students, that state standards and curriculum frameworks will change, and that our students will be expected to read more non-fiction more closely and learn to read and write in new genres. How can we use technological tools to aid this process? And how can we incorporate these standards into our teaching in a caring and thoughtful way? What an incredibly useful resource! Learning about the CCSS through a webquest format is a great idea. I also greatly appreciate the free text complexity modules on TextProject (and the overview you provided through your IRA research poster). Exciting and very useful. Thanks for sharing!